Opiate abuse has become a national health emergency, and Manatee County has been especially hard hit with one of the nation’s highest rates of opioid overdose deaths. Tackling this crisis is a top concern of health professionals and advocates, including mental health counselors. That is why professionals from health, community service programs and law enforcement will gather Saturday, Feb. 23, at USF Sarasota-Manatee to discuss strategies to fight this epidemic, raise awareness and promote addiction treatment services. 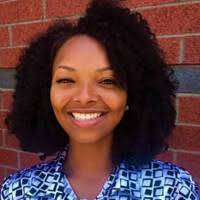 Behavioral health advocate and activist Leah Hill, who collaborated on the Surgeon General’s recent opiates panel, will deliver the keynote address. The conference, “Releasing the Chokehold: Opiate Use Nationally and in our Communities,” is open to the public and features notable panelists, including Nathan Scott, the child-welfare policy coordinator at the Family Safety Alliance; Sara Smith, a marriage and family therapist at the Miami Rescue Mission; and Det. Carl Jones of the Bradenton Police Department. The Duvall program sponsors the annual Family Studies Conference, including this upcoming event. The conference runs Feb. 23, from 8:30 a.m. to 5 p.m., at the Selby Auditorium at the USFSM campus, 8350 N. Tamiami Trail, Sarasota. Tickets are $25, which includes morning pastries, coffee and lunch, and must be purchased in advance. The deadline for tickets is Feb. 20. 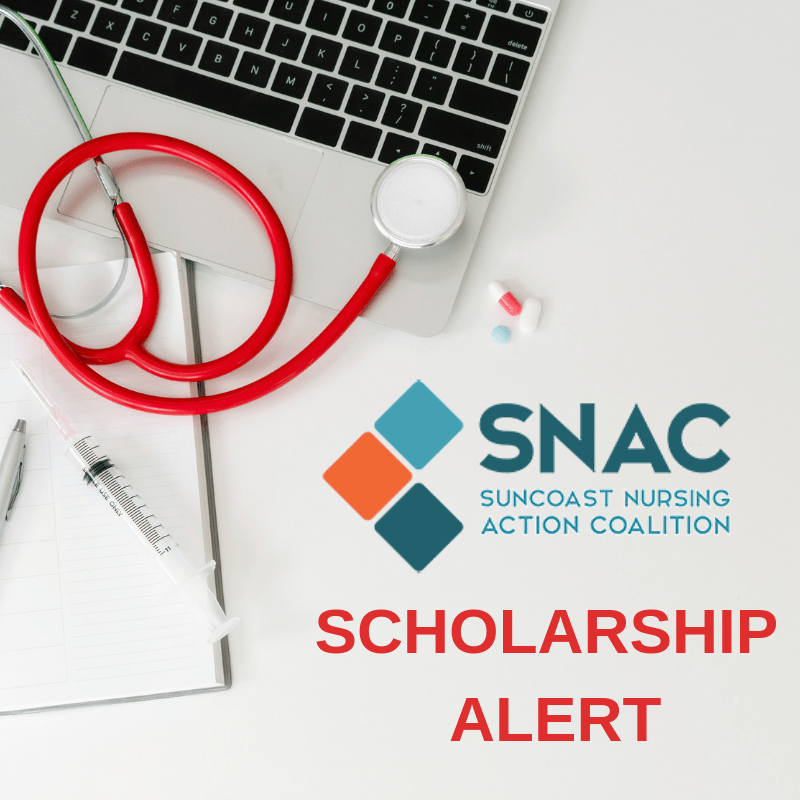 SNAC is pleased to share the 2019 application for the Suncoast Nursing Action Coalition’s BSN Scholarship opportunity. 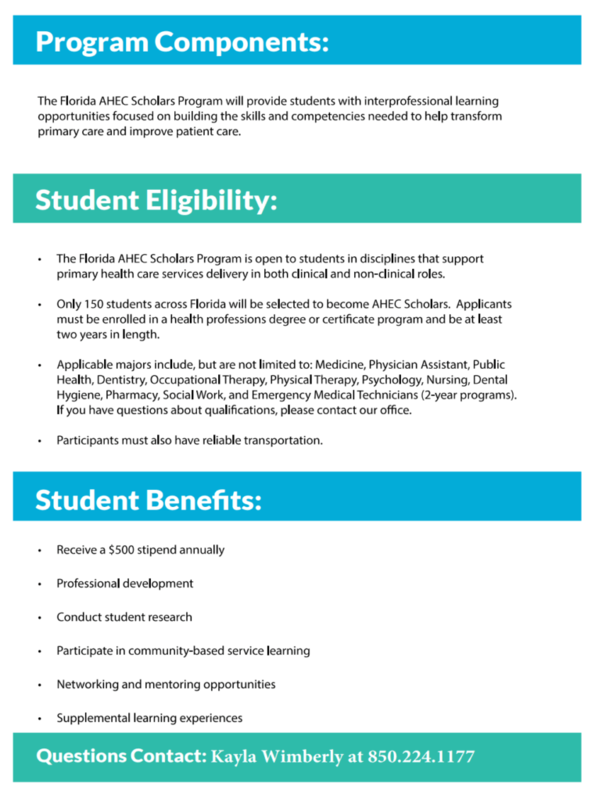 This scholarship provides financial support for current BSN candidates in the SNAC Region (Sarasota, Charlotte, Manatee, & Desoto Counties). The goal is to increase the number of bachelor’s prepared nurses who are working within the Suncoast Nursing Action Coalition (SNAC) region. This is a $2,500 scholarship opportunity for individuals in an accredited BSN nursing program. The amount awarded per person may vary and is at the discretion of the SNAC selection committee. Award amounts will be based on individual need as determined by documented sources of support (e.g. scholarships, grants) with a minimum award amount of $2,500. The application description and all supporting materials can be found online. The application submission is an online process. 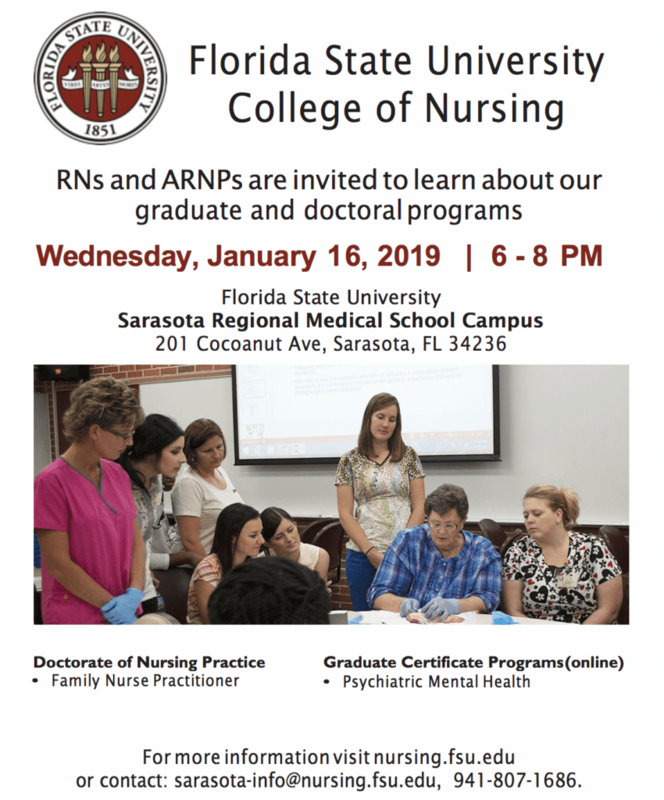 Florida State University College of Nursing invites RNs and ARNPs to learn about their graduate and doctoral programs! Kick off the New Year by making a change to better your career and future! MMH Competency/ Education Fair includes Nursing Program Representatives to help you advance your Professional Career. Manatee Memorial Hospital Wednesday October 17 @ 7:30 AM to 11:30 PM in the entry atrium. Use your MMH tuition assistance dollar$ today! Come on down and meet your Nurse Education Navigator, Kate Garber. The NEN role is to assist anyone initiating or advancing a nursing career. Kate Garber’s services are provided FREE by the Suncoast Nursing Action Coalition SNAC, a local coalition comprised of nursing academia, healthcare employers, and community volunteers. Kate will be your mentor, coach and concierge as you continue to develop your nursing career; right up to a doctorate! SNAC has awarded $214,000 in Nursing BSN and Doctoral scholarships in the last 2 years! Find out how to apply. Would you like to distinguish yourself as part of an interprofessional cadre of health professions students committed to community service and transforming health care practice? 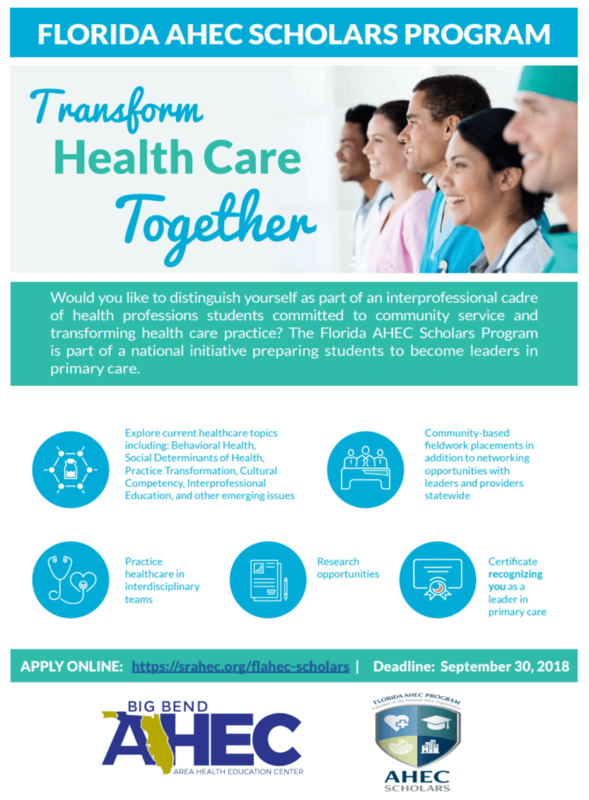 The Florida AHEC Scholars Program is part of a national initiative preparing students to become leaders in primary care. … Build skills to transform primary care and improve patient care. “When my husband Mike and I were weighing whether to move to Sarasota, one of the important factors we took into consideration was the level of quality healthcare available in the region. 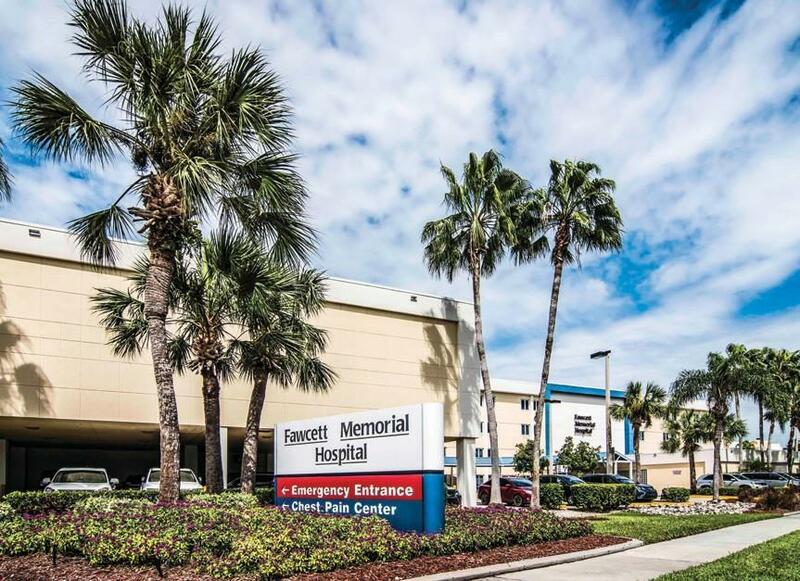 It’s no secret that we are all fortunate to have a number of world-class institutions like Sarasota Memorial Hospital and Tidewell Hospice that are leading the way in ensuring our community’s residents are well taken care of when it comes to their health. While providing world-class facilities needed to meet our region’s healthcare demand is important, the bigger undertaking is ensuring those facilities are filled with passionate and highly qualified professionals. 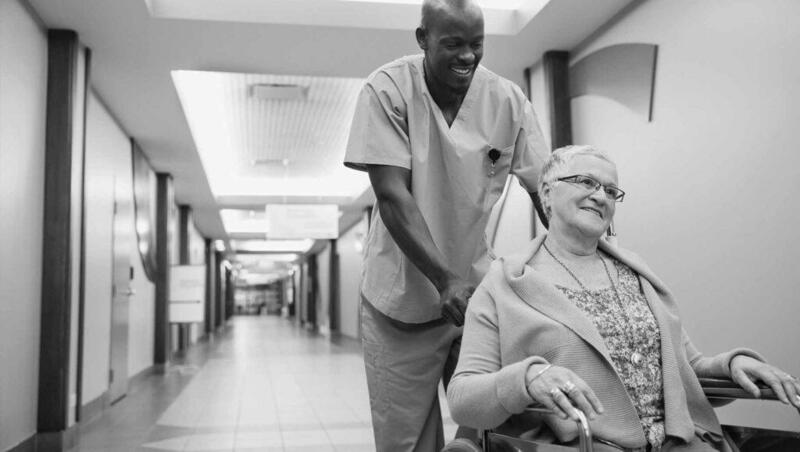 Fortunately, to counter a critical and prolonged nursing shortage in Florida, we have organizations like the Suncoast Nursing Action Coalition to help. After learning the mortality rate of patients decreases as the qualifications of the nurses treating them rises, the Community Foundation of Sarasota County and The Patterson Foundation partnered with the Suncoast Nursing Action Coalition in 2014 to strengthen the educational opportunities available to nurses working in our local hospitals and those with dreams to become nurses. By collaborating with local hospital, nursing, academic and community leaders from Sarasota, Manatee, Charlotte and DeSoto counties, the partnership has created a robust pipeline of highly educated nurses in our region. 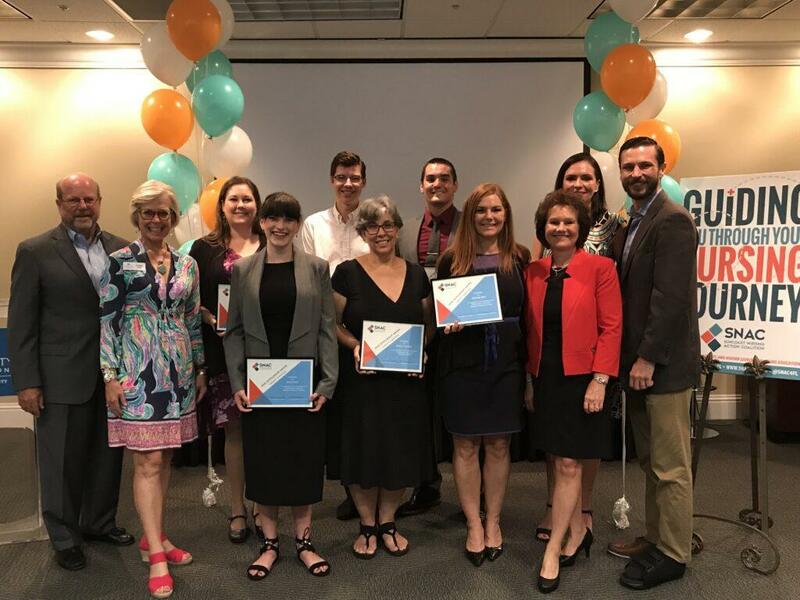 The best part is none of the financial burden of being a student is put on the nurses, as community supporters provide scholarship awards stewarded through the Community Foundation of Sarasota County. Shown from left: Charles Baumann (Co-Founder SNAC), Roxie Jerde (President/CEO of the Community Foundation of Sarasota County); scholarship recipients Elizabeth Endress, Emily Koch, Kenneth Elliott, Dorothy Neufeld, Damon McIntyre and Nathalie Barr; Jan Mauck (Former Chief Nursing Officer, Sarasota Memorial Health Care System and Co-Founder SNAC); scholarship recipient Yulia Crosley; and Earl Young (Scholarships manager, Community Foundation of Sarasota County). SARASOTA, Fla. (Aug. 15, 2018) – In response to a critical and prolonged nursing shortage, the Suncoast Nursing Action Coalition (SNAC) awarded 22 scholarships totaling $74,000 today to strengthen the region’s nursing workforce and boost the number of nursing school instructors training students on the Suncoast. The scholarships are part of a grassroots plan to develop a robust pipeline of well-educated nurses to replace a wave of retiring nurses and ensure continued access to safe, high quality care on the Suncoast. The American Nurses Association estimates that the U.S. will need to train more than a million new nurses by 2022 to offset the prolonged and worsening nursing shortage. The situation is most concerning in Florida, where the number of residents over age 65 is twice the national average and concerns are mounting over whether there will be enough to care for the largest generation living today, the retiring baby boomers. Since 2016, SNAC has awarded $214,000 in nursing scholarships to 58 local recipients (including those awarded today). Most are slated to graduate in the next two years with a BSN degree in nursing, with plans to work locally. SNAC also has granted six scholarships to regional nursing faculty pursuing doctorate degrees in nursing. Despite the shortage, nursing schools have had to turn away tens of thousands of qualified applicants each year because they lack the facilities and faculty to train more BSN students. Nursing Education Navigator (NEN) – In 2015, SNAC hired a NEN to advise and mentor people interested in a nursing career. From February 2015 through April 2018, the navigator has counseled 845 students/nurses and referred 539 to nursing programs. At least 177 are currently enrolled in accredited nursing school programs. Nurse Training Programs – SNAC is helping hospitals and colleges develop and expand programs that provide direct and accelerated pathways for BSN nursing students. Local partners Florida Southwestern State College, Keiser University, State College of Florida/Manatee-Sarasota, and the University of South Florida/Sarasota-Manatee all have created new or expanded curriculums and facilities that are allowing more nurses to enroll in four-year BSN programs in their hometowns this fall. Nursing Education Fair Fawcett Memorial Hospital Tuesday August 21 @ 11AM to 1:30 PM in the cafeteria. Use your HCA tuition assistance dollar$ today!